Fountain fog effects at the Starlight Amphitheater in Kansas City, Missouri may steal the show! This theater took advantage of Koolfog’s dry fog and installed nozzles that emit fog effects lit by colored lights. The effects are amazing and contribute to the guests’ positive first impression of the amphitheater. 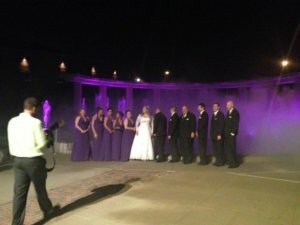 One couple found the fountain fog effects so stunning, they took their wedding photos in front of the fountain! Fog effects are a great way to add a new layer of visual intrigue to a landscape or fountain project.